An analysis of the just-released Annual Report of the Central Information Commission (CIC), the Central right to information (RTI) watchdog, has revealed that the office of Prime Minister Narendra Modi witnessed a whopping 44% increase in the number of RTI applications received in 2014-15 (12,674) as compared to 2013-14 (7,077). 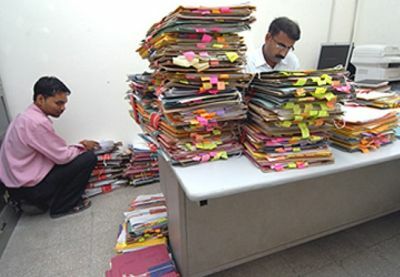 As for the Finance Ministry, Nayak said, it received the highest number of RTI applications, 140,324 of all ministries. At the same time, he added, the proportion of rejection has increased by 1% in 2014-15 (20.20%) as compared to the previous year. The Defence Ministry, said Nayak, witnessed an increase of 11.7% in the number of RTI applications received (35,082) in 2014-15 as compared to the previous year. The rate of rejection has also shot up from 12% to almost 16% in 2014-15. On the whole, Nayak said, the proportion of rejection of RTI applications shot up by 1.2% in 2014-15. While only 7.20% of the RTI applications was rejected in 2013-14, this figure has increased to 8.40% in 2014-15, he reported, calling it a “cause for worry”. Nayak's analysis shows that in 2014-15, more than 35% of the RTI applications were rejected under Section 8(1)(j) of the RTI Act, under which information relating not related to any public activity or interest or one that would cause unwarranted invasion of the privacy of the individual, is exempt. “About 20% of the RTI applications were rejected under Section 8(1)(d) which exempts information in the nature of commercial confidence, trade secrets or intellectual property, making it the 2nd most invoked exemption”, he said, adding, this is followed by “Section 8(1)(e) relating to information made available in a fiduciary relationship (14.6%).